Graham Stead (No.17 in the list of male British team members) was born in Birmingham on 1st February 1930. He lived just a stones throw away from the Birmingham Embassy roller rink that he often frequented, but was a relative late comer to speed skating when he joined the NSA in 1950. Skating for the Birmingham club, Stead was soon amongst the major medals when on 24th November 1951 he finished second to fellow Birmingham team mate, Bernard "Bunny" Bennett, in the Midland Counties Championship on Granby Halls, Leicester. A year later he would repeat his silver medal performance in the same event, albeit the Northern and Midland Counties Championships were now amalgamated into a single event. By 1953 Stead was recognised as one of Britain's top skaters. On 14th March that year he won his first British Championship medal when he finished a close second to Jackie Reeves (Broadway) again on Granby Halls. Reeves was reigning Champion and a former international, so Stead's performance was certainly one worth noting. In January 1954 Stead once again made the final of the Half Mile British Championship and again the venue was Granby Halls. This time it was to be a bronze medal behind the Broadway duo of Denis Hill and Jackie Reeves. Hill was a multiple World Championship medallist and British Champion and was considered to be the best skater of his time. For Stead to be mixing it amongst the likes of Hill and Reeves showed just how far he had come in such a short space of time. A few weeks later and Stead was once more amongst the medals at Granby Halls with yet another second place in the Northern and Midland Counties Championship, behind Bob Tankard (New Bradford). Throughout the season Stead also helped the Birmingham club secure the British Team Championship for the Chambers Trophy. Despite these performances, when the British team was selected for the World Championships in Bari, Italy, later that year, Stead was not named amongst them. Stead had taken no fewer than five major medals in his skating career so far, but although he belonged to the Birmingham club who held intense training sessions at the Birmingham Embassy, astonishingly every single medal had been on Granby Halls. It is possible that the NSA looked upon this as "inflexible", but nevertheless, Stead knuckled down and continued to do what he knew best. Train hard and enjoy skating. 1955 was a lean year for Stead. There were no major medals to write home about and nor was there any World Championships that year to contend. In 1956, however, all that was to change. This was the year that Stead would shine. On 14th January 1956 Stead was yet again a silver medallist in the Midland Counties Championship (the Northern Counties having been separated once more), behind team mate Leo Eason and once more on Granby Halls. It must have felt like deja vous to Stead and a feeling of frustration that he simply couldn't find that little bit of something extra that would turn silver to gold. 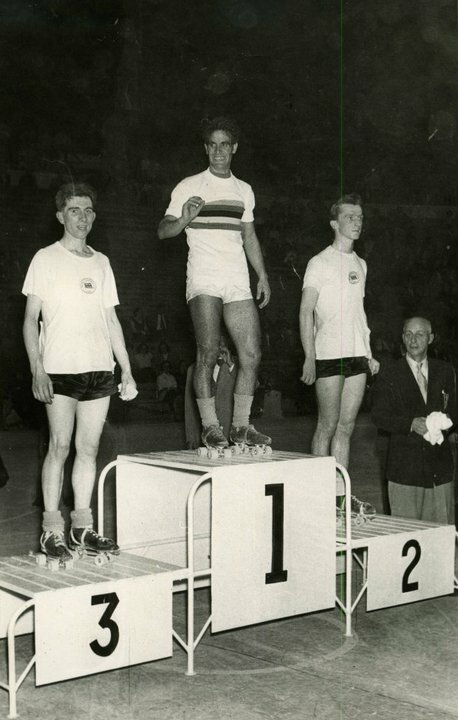 On the 18th February he again finished second to Leo Eason, this time in the One Mile British Championship, but more noticeably it was on his home track, the Embassy, with his best friend and World medallist, Les Woodley in third, making it a one-two-three for the Birmingham club. Finally, Stead had got the "Granby Halls monkey" off his back. A week later, on 25th February on the Alexandra Palace rink, Stead wrote himself into the record books when he finally won a British title, the Five Mile. Just behind him were Roy Parsons (Broadway) and Alan Cattee (Rochester United). Coupled with a win for Birmingham in both the British Team Championship and British Relay Championship it was an almost certainty that barring any unforeseen circumstances Stead would be in the British team for the forthcoming World Championships in Barcelona, Spain, so when his name was announced there was little surprise from fellow skaters. Not long afterwards Stead was asked to be best man for Les Woodley when he married Barbara Howard in the spring of 1956, something Woodley would later reciprocate for Stead in 1962 when he married Jean Key. The 1956 World Championships were held on an indoor rink in Barcelona in October of that year. Over the two days Stead would skate in all four individual events plus the Coupes des Nations Relay. Stead's performances at these Championships were something to savour. He would finish a superb 4th in the 1000 metres knockout, the 10000 metres and 20000 metres, but the icing on the cake for Stead came in the 5000 metres when he took home a bronze medal, finishing just behind Loriano Lori (Italy) and his best friend and team mate, Les Woodley. It was a fantastic achievement for Stead. Further, in the two man relay, Stead teamed up with Geoff Wright and together they managed third place behind the two strong Italian teams. Stead was flying high. ".....the apparent absence of a suitable outdoor surface in London or the provinces on which skaters could undertake training prior to selection in the team, the short notice received of the events taking place and the considerable expense that would have to be borne in travel to the venue". As with many others, Stead was less than impressed. It was an opportunity missed as far as he was concerned and after such a successful debut in Barcelona was itching to improve on his medal winning performance. But it was not to be. Throughout 1957 Stead's interest started to wain. This carried over into 1958 by which time there were new names emerging as potential stars of the future, the likes of Danny Kelly and Dennis Stafford, both of whom would make the British team for the 1958 World Championships alongside Geoff Wright and Leo Eason. At the end of 1958 Stead "retired" for the first time. Stead was never much one for politics, he skated to enjoy himself, and despite being a World medallist a pint and a laugh at the end of a race was as important to Stead as the medals and trophies, if not more so. He was starting to see a change within his club and the other clubs around him where the rivalry was starting to spill over as back biting and animosity towards each other. Stead didn't much care for that. By 1960, however, Stead's interest in speed skating was rekindled. His old team mate at Birmingham, Les Woodley, had now joined up with the formidable Midland club alongside Danny Kelly, Ricky May and Ray Roberts. As a relay quartet they were undoubtedly the best Britain had ever produced up until that time, and arguably the world. Woodley, if nothing else, was very persuasive and he convinced Stead that a fresh start was needed and with that he joined Midland. Very soon he was once again amongst the front runners, so much so in fact that he was named as reserve for the now infamous 1960 World Championships in Wetteren, Belgium. Stead may well have made the team but medication he was taking for a removed tooth made just before the trials meant that his performance was well below par. Travelling with the team, Stead took part in the preliminary races held on the Championship circuit, and duly won them. At the start of the 1960-61 season Stead's form was good. On October 22nd 1960 he placed second in the Davis Cup to New Zealander Ian Hughes. On the 3rd December, however, he entered the Half Mile Championship on Brixton, a circuit he had never raced on before. The Brixton rink was skated as one huge circle and the fastest indoor rink in the world, as had been proven on numerous occasions with the setting of so many world records here by British skaters. Woodley gave Stead some tips on how to skate the circuit, but deep down Stead knew he wasn't "up" for the event. In his persuasive manner Woodley convinced Stead that he should give it a go, and so as Stead's heat came around he took to the floor alongside his competition. The gun went and off they all went, all except Stead that is, who let them go, turned around and walked off the rink "to have a cuppa" as he put it. Woodley went on to win the Championship. This event bought short shrift from his then fiancee, Jean, who Stead had taken all the way to London only for her to watch him walk off the rink without having skated a yard, let alone a lap. By way of recompense, the following day, 4th December, Stead went out and won the one mile scratch race for the Squire Cup at Rochester Casino. Amongst the 71 entries was a young John Folley and Ron Hawkes who would push Stead all the way in the final, but the victory was his and he gave Jean no excuse this time to give him a ticking off. Then on 28th January 1961, nearing his 31st birthday, he would finish third in the One Mile British Championship behind team mates Les Woodley and Danny Kelly, making it a one-two-three for Midland. On 25th February 1961, unbeknown to Stead at the time, he won his last gold medal. The Three Mile British Relay Championship was held at the Birmingham Embassy and the quartet of Woodley, Kelly, May and Roberts had won the event for Midland in the previous two years. This time, though, with Stead amongst them, Ray Roberts gave way to the former international and British Champion. Midland won the event in a then astonishing time of 8 minutes 29.4 seconds, almost half a lap ahead of their nearest rivals, Birmingham. 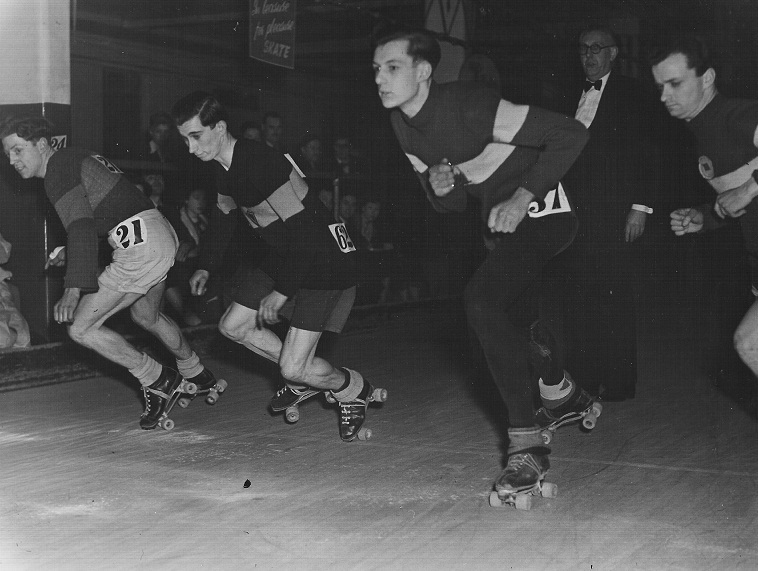 "Two International events in Roller Speed Skating....took place during the past season for which no British skaters were entered in sustantiation of the Roller Speed Committee's view strongly held, of the deficiencies in the organisation of the World Championships held on road in Belgium in 1960, and as referred to in the previous year's Report". Once again Stead, as with the rest of the British elite skaters, felt they had been short changed. At 31 Stead knew it may well have been his last chance to pull on the white jersey for Britain. On 2nd December 1961 Stead won his last medal, a bronze in the Northern and Midland Counties Championship, again behind team mates Woodley and Kelly. 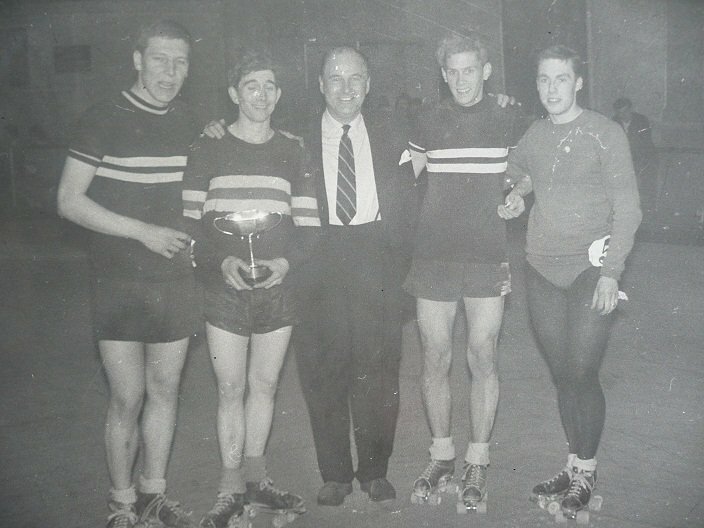 By the time the Five Mile British Championship came around on 24th March 1962, Stead knew his skating career was almost at an end. Finishing some way down the pack in the event he won six years previous, Stead came off the rink and looked for new ways in which to dedicate his life. Shortly after his retirement he married his fiancee Jean and found new enthusiasm and enjoyment with his family. Graham Stead is one of those skating characters that do not readily spring to mind when people speak about the elite of British skating. But not to do so would be a massive oversight, for Stead was as good as anybody on his day, as was proven in the Five Mile British Championship of 1956. For someone who came into the sport relatively late and then rise through the ranks at an amazing rate is no small feat in itself. But to then go to his first World Championships and bring home an individual medal, as well as just missing out on three others in the only other three events, is nothing short of remarkable. From 1000 metres to 20000 metres or half mile to five mile, Stead was always amongst the top echelons of talent. Above all, though, he was his own person. He raced for the pure fun of it and enjoyed the social side just as much, if not more so, than winning. To him this was what the sport was about and not the "win at all costs" attitude he felt was starting to take hold. Stead would miss out on possible further World accolades through the obstinacy and short sightedness of the then Roller Speed Committee, but nevertheless his achievements in the 1950's and early '60's mean that he will always be considered a British skating legend.